At first glance, the cavernous warehouse space near the Tacoma Narrows Airport in Gig Harbor appears an unlikely birthplace for art. But step inside and what you’ll see is shelves upon shelves of colorful and intricately hand-painted wine bottles, cousins to bottles that sometimes bring thousands of dollars at auction and become collectors, items for their owners. Despite what its relatively modest local profile might suggest, Fresh Northwest Design isn’t a new company. 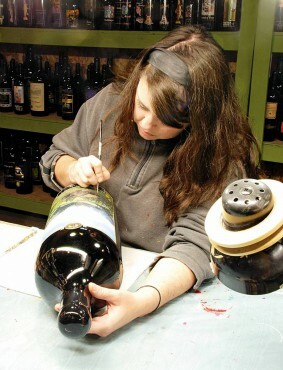 Charles and Annie Morningstar started the business in 1989 and built a reputation among Washington and Oregon wineries as the go-to place for custom-designed, etched and hand-painted wine bottles. At the time, Schoenen was working for the University of Washington, helping business school graduates find corporate jobs, a world with which he was and is intimately familiar. 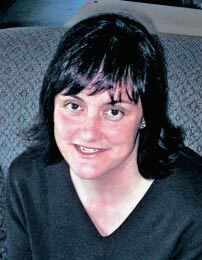 Schoenen holds a master’s degree in business administration from New York University. He spent years working for some of the biggest names in business and technology including Merrill Lynch and Lucent Technologies (a spin-off of AT&T), overseeing multimillion-dollar marketing campaigns and budgets and living in such far-flung places as Australia and Singapore, not to mention multiple locations across the United States. “You name it, I’ve been there,” he says. His new life seems as far from the world of high-pressure marketing as Gig Harbor does from New York City, where he lived for 15 years prior to his trek west. Now he lives in a modest 1950s rambler in Tacoma and spends most of his days working closely with his company’s 10 full-time, mostly-20-something employees in a decidedly casual atmosphere, where rock music plays almost constantly and jeans and T-shirts are the typical workplace attire. The change in lifestyle for Schoenen is deliberate and welcomed. “I wanted a better quality of life and to be closer to the ocean,” he says. He also wanted to be closer to his mother, who lives in Portland, Ore., and who was diagnosed several years ago with leukemia (the cancer is now in remission). “What’s nice about this business is that, at the end of the day, you’re bringing a smile to your client’s face. That’s a nice business to be in,” Schoenen says. 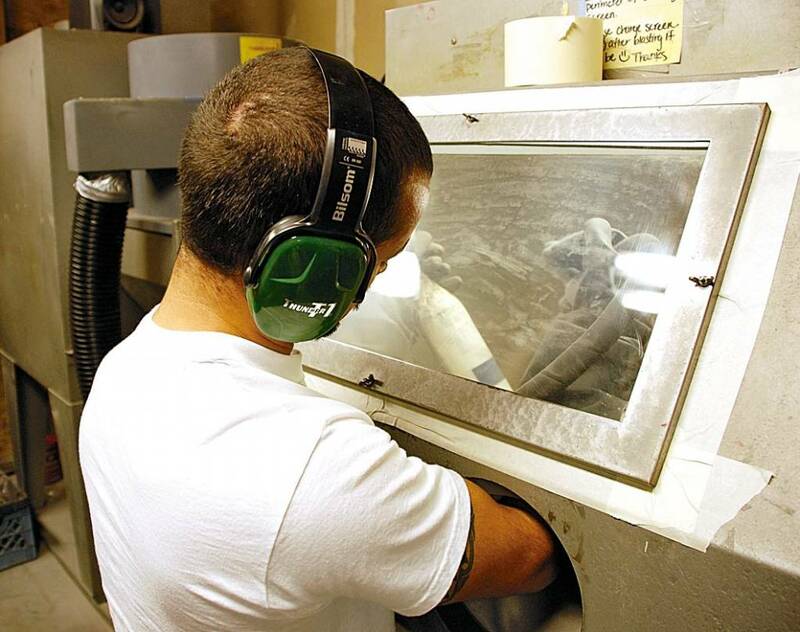 After buying the company, Schoenen made some operational changes, including upgrading equipment, increasing salaries and adding healthcare coverage for his employees, and stabilizing the production schedule so his employees have regular, dependable hours year round. The company’s clientele includes many of the Pacific Northwest’s preeminent wineries, major national and international corporations, schools, various charities and sports teams. 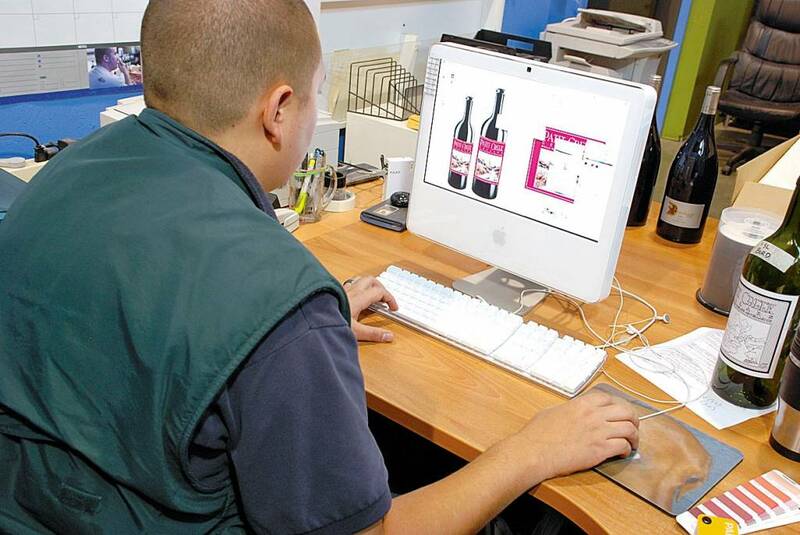 Organizations place orders for custom wine bottles for a variety of reasons — to commemorate an event or the launch of a new product, to recognize top donors or clients, to reward outstanding employees, or to raise money for charity. There are myriad possibilities. Because the process is so time-consuming, Schoenen currently has no plans to expand into the retail market. “I don’t think we can be price-competitive in that market,” he says. 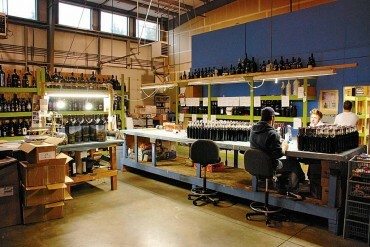 One corporate client annually orders 2,000 custom bottles, which roughly translates into 10,000 hours of labor or more. Each bottle, depending on the complexity of the design, takes anywhere from five to eight hours to produce. Some of the more complicated bottles can take several days to complete. Because the bottles are all individually crafted, no two are exactly alike, though the minor differences are all but invisible to the naked eye. The process begins when a client approaches the company with a design or an idea for a bottle, which may include original artwork, a corporate logo, or even a hand drawing. If the idea is still a rough concept, the company’s talented crew can often help custom design the label. 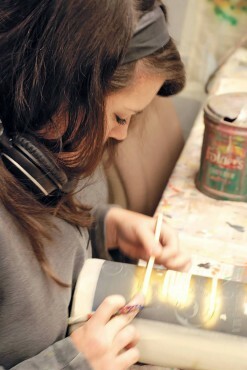 Then the design is adapted, on the computer, for what will be a three-dimensional end product. 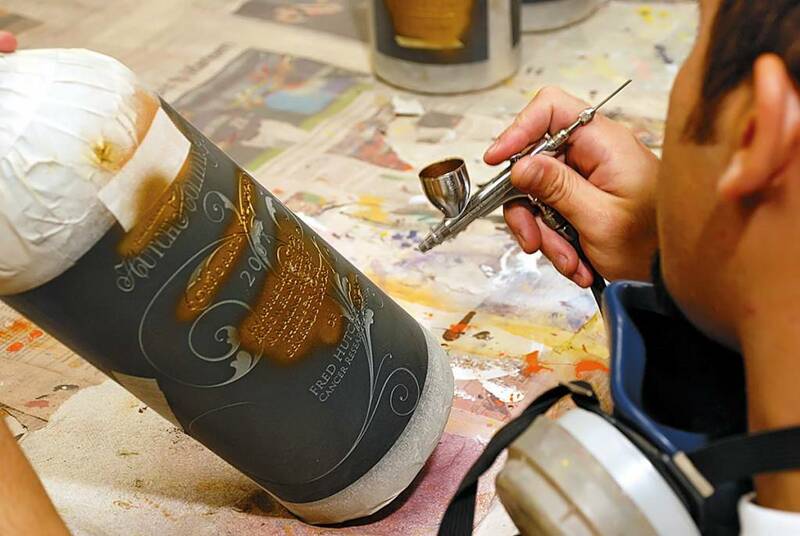 After the final design is approved by the client, a separate template is created for every bottle. The template is attached to the bottle and the rest of the bottle is covered with masking tape to protect it during the etching process. The etching is done in a large sandblasting machine, where the bottle is maneuvered by hand while it is bombarded by a steady stream of sand that chisels the design into the bottle through openings in the template. 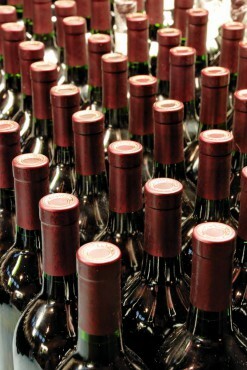 The process doesn’t involve any heat, so it doesn’t alter or damage any of the bottle’s contents. Once the design is etched onto the bottle, it’s ready for painting. Airbrushing can be used to fill in some background colors, but all the detail work must be meticulously and carefully done by hand with oil-based sign paints. The bottles are then “cured” for up to 24 hours before the masking tape is removed, and are prepared for shipping. 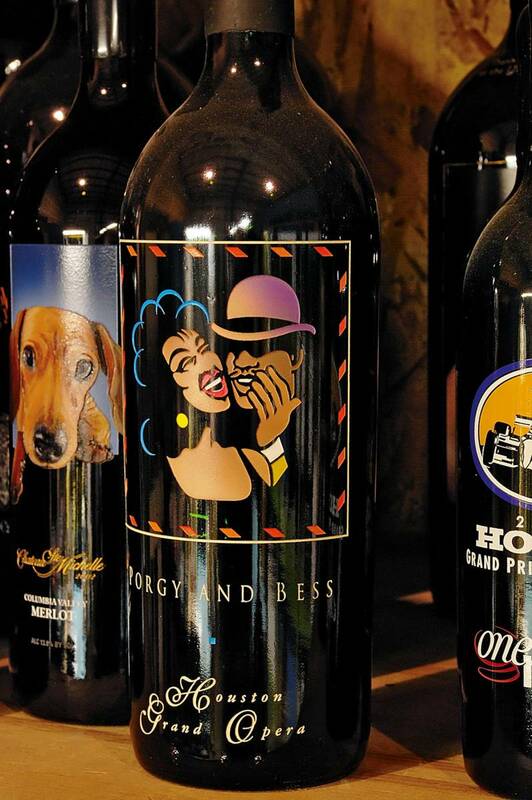 The fundraising potential for the custom bottles, especially when paired with superior wines, is impressive. 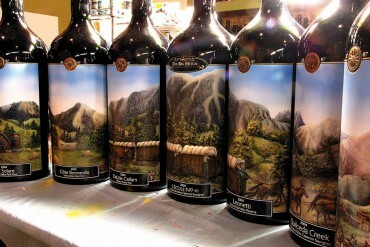 For the past 13 years, for example, the company has produced a series of 6-liter bottles for the Sun Valley Center Wine Auction in Sun Valley, Idaho, which supports the local arts. This past summer, the lot, which included seven bottles depicting a panoramic mountain scene on one side and the individual winery labels on the other, brought $60,000 at auction. In 2006, two 6-liter bottles of Quilceda Creek Cabernet Sauvignon raised $20,000 at the Auction of Washington Wines in Woodinville. Schoenen sometimes works to bring corporations and wineries together, which gives him the opportunity to promote Washington wines. “We end up being a little bit of a cheerleader for Washington wines, which I think is a benefit,” he says. If the owners of the bottles want to actually consume the contents, Schoenen offers to take the empty bottles, fill them with black water and reseal them. 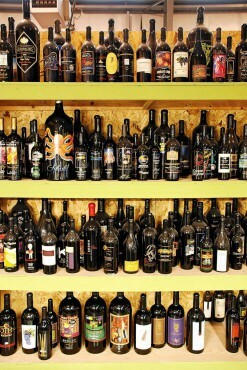 For many people, the bottles become prized collectibles and displayable works of art. In this case, seeing really is believing.